I used to love Pop-Tarts. Unfrosted strawberry ones were my favorite. Yes, I'm a Plain Jane Pastry kind of guy. I don't, therefore, remember eating as depicted in the great drawing. (See more here.) I just broke mine into pieces and sometimes had it with milk. Yummo. So, I'm curious. 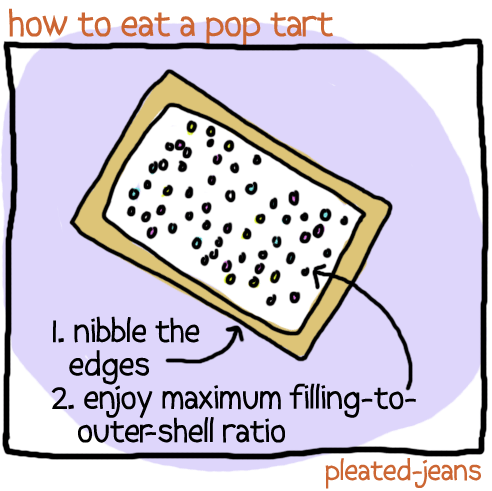 How do you eat YOUR Pop-Tarts? We are not a pop tart family. Weird. Yes that would be us. Wait... is there a DIFFERENT way to eat pop tarts? My family used to get pop tarts, until we found cheese danish could fit in the slots of the toaster. Now I usually get croissants or pain chocolat if it's for breakfast. You TOASTED them? I ate them raw. It was the original raw food movement. Like many things in life, pop tarts are always better toasted.